← ACEI’s New Mail Processing Centers and After Hours Message Center! Time for some country facts! In this week’s blog, we’re going to look at Bhutan, officially known as the Kingdom of Bhutan. This landlocked country in South Asia is nestled in the eastern end of the Himalaya mountains bordered by India in the south, east and west and by China in the north. It’s regarded as one of the most isolated nations in the world mainly because the Bhutanese government has regulated foreign influences and tourism to a great extent in order to protect and preserve the nation’s identity, culture and eco-system. 1. Bhutan is a democracy and constitutional monarchy. The Bhutanese monarchy was founded in 1907. It held its first democratic elections in 2008. 2. In 1865, Britain and Bhutan signed the Treaty of Sinchulu, under which Bhutan would receive an annual subsidy in exchange for ceding some border land to British India. Under British influence, a monarchy was set up in 1907; three years later, a treaty was signed whereby the British agreed not to interfere in Bhutanese internal affairs, and Bhutan allowed Britain to direct its foreign affairs. This role was assumed by independent India after 1947. 3. The United Nations recognized Bhutan as a country in 1974. 5. Bhutanese call their home “Druk Yul,” which means “the Land of the Thunder Dragons,” because of the extremely powerful storms which constantly roar in from the Himalayas. 6. Its capital is Thimpu with a population of about 742,737 (2012). It is the only capital in the world without traffic lights. In fact when traffic lights were installed the people objected and the city reverted back to the use of white-gloved traffic police. 7. Until the 1960’s it had no roads, automobiles, telephone, postal system or electricity. Bhutanese had no access to TV or Internet until limited access was permitted in 1999. 8. Buddhism is the official religion with Hinduism the second popular faith. 9. Dzongka is the official language. 10. 54.3% of adults and 76.2% of youth in Bhutan are literate. 11. The first foreign tourists were allowed into Bhutan in 1974. 12. Bhutan has the world’s highest unclimbed peak, Gangkhar Puensum, a mountain so sacred by the Bhutanese that the government has banned mountaineering on any peak above 19,685 feet. 13. Bhutan is the world’s only carbon sink, that is; it absorbs more CO2 than it gives out. It sells hydro-electrical power, making it the only country whose largest export is renewable energy. 72% of the country is forested. In fact, it’s in the country’s constitution to keep 60% of its land forested. Respect for the environment, the eco system and all species is a serious matter in Bhutan. Anyone caught killing an endangered species, faces the harsh sentence of life in prison. 14. Agriculture is its major industry with rice, fruit and dairy industry (yaks). 15. Rather than using the GDP as an economic index, Bhutan measures its overall “health” through the four pillars: sustainable development, environmental protection, cultural preservation, and good governance, which together form the Gross National Happiness or GNH. Not all was as happy as hoped when in the early 1990s riots erupted in the Nepalese community living in Bhutan after the King’s decree to have all Bhutanese follow traditional customs including dress and conduct. This led to the repatriation of about 40,000 Nepali-Bhutanese to Newark, New Jersey, USA in early 2010. 16. Plastic bags have been banned in Bhutan since 1999. 17. Bhutan is the only country to outlaw tobacco (effective 2004). 18. 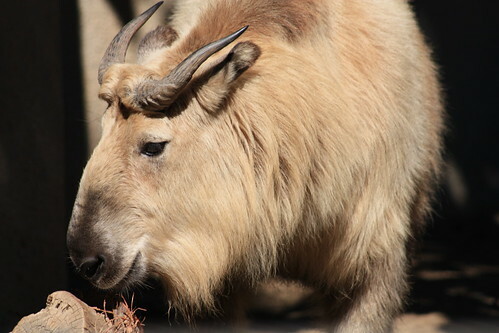 The “takin,” a goat-antelope, is Bhutan’s national animal. 19. The country’s two national sports are archery and darts. But unlike a regulation dartboard, theirs is much smaller and the darts heavy and quite lethal which are thrown over 20 meters toward the target. 20. All citizens officially become one year older on New Year’s Day. This way, no one forgets anyone’s birthday! 21. Need some good luck? Thinking of starting a family? Bhutanese have a long tradition of painting phalluses on their houses to serve as a symbol of fertility and good luck. All part and parcel of a nation that measures its annual success by its people’s rate of happiness! For a fun article and photos of houses adorned by phalluses go to this link: Phallus Alert: Fertility Blessings in Bhutan! 742,737 is the population of the whole country. Population of Thimphu is approximately 100,000. Your second fact about bhutan.. It gained its independence in 1947..This is false..Bhutan never lost its independence to country..
India gained independence in 1947, not Bhutan. Bhutan has always been a sovereign country…….. we never lost our independence. Based on garra’s comment we’ve updated #2. Thank you for your feedback! 7. Begun the process of developing GNH accounting. Great article. So well-researched. 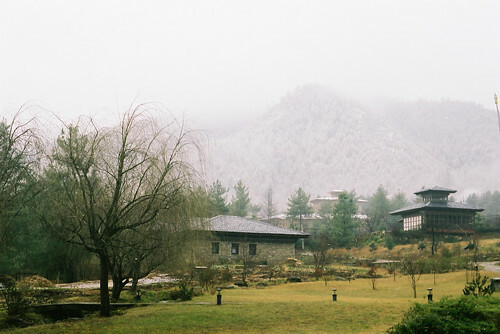 Bhutan is such a beautiful country, I cannot wait to visit! Appreciate all your great comments and links. The photos in the link provided by Jigmerct are beautiful. Thank you! Hello everyone.. I am doing a research about Bhutan culture for my assignment. Just wondering about the facts that has been mentioned that ll citizens officially become one year older on New Year’s Day. Is that true? Is that means, no one celebrate their own birthday on the actual day? Can anyone explain further? And can anyone also help me to highlights special cultural practices of Bhutan? Thank you in advance for you help. Much appreciated. we follow two forms of calendar, i.e. Tibetan aka Chinese calendar and the christian calendar. However, the official calendar is the Christian calendar. Its rather a misconception the Bhutanese celebrate their birthdays on new year, that being said, its up to the will of the individuals whether to celebrate their birthdays or not. however, following the tibetan Calendar, yes, the individuals do become one year older during the new year (probably falls during the month of february). but they still celebrate their birthdays on their respective birth date. hopefully, i have been helpful in answering your queries. Thank you for sharing all this information about Bhutan! Would love to visit Bhutan one day! !